Our medals! They have our names and trail names engraved on the back. After our night at Manning Park, we drove with Aunt Rose and Jon back to Vancouver, where we stayed for a few days. We walked around in cultivated gardens and saw sites and went Canadian bowling and flew kites and ate lots of delicious vegan food. As much as we loved it, we were eager to get back to Portland to see Zach’s dad, sister, and grandma. We hopped a bus to Portland. Zach’s sister Ivy picked us up from the bus stop and drove us to Grandma Diane’s house. Grandma Diane cried when she saw how emaciated we looked. Gary took us out to dinner. I wondered if I’d ever get used to sleeping in a bed, under a roof. All our dreams came true: the pizza, the video game marathons, the time with family, but I remember it vaguely, like there’s a veil of fog over it. We ate every two hours, constantly fighting a survival instinct that urged us to chuck every edible thing in sight into our mouths. Grandma Diane fed us a lot of ice cream sundaes and lunchmeat sandwiches. We tried to stop eating so much, but it was hard. Zach, despite how much he ate, hated food. After five months of cramming calories down our throats, he was done. It was several months before he actually enjoyed eating again. We didn’t walk at all for a long time. We felt heavy and strange and full of food. I had to re-learn all my social skills— the strange disjointed pattern of conversation on trail seemed odd in real life. For months I felt like my body was too big, that I took up too much space. I kept on running into things because I wasn’t used to being in a small space (indoors) for more than a few hours at a time. At the end of October, we ended up getting a van, and driving from Portland back to St. Louis, taking Ivy with us for a visit. We drove along breathtaking cliffs in Oregon and Washington, saw larch-covered mountains and massive plains in Montana, couch-surfed all the way home, got our tire slashed in Bozeman, didn’t visit Yellowstone because we wanted to see family more than we wanted to see nature things, drove through South Dakota’s beautiful barren hills, passed through my dad’s childhood haunts in Sioux City, Iowa, and at last found ourselves pulling up alongside my parents’ home in St. Charles, Missouri. This would be our home, too, for the next several months. We got medals sent to us in the mail, engraved with our names and trail names. They were completely worth it. At this point, I began writing the memoir. I looked through my sparse journal entries, and cross-referenced them with our maps, my photos, and our memories. I pieced together the story, bit by bit. We lived in my parents’ spare room, saving our money. We paid off our trail debt by Christmas, and had saved up enough to buy our own house in June. 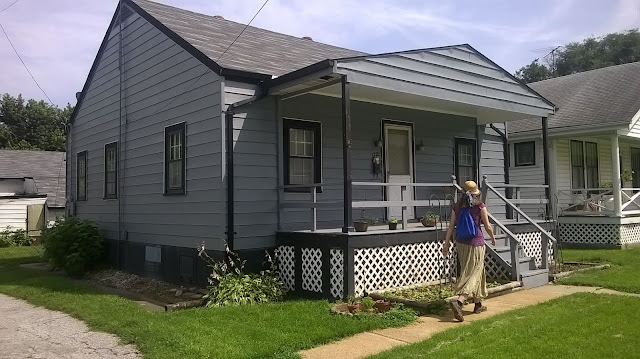 We bought a two-bedroom house in St. Charles and settled down, with a garden and a mortgage and steady jobs. Our house! Isn't it cute? And through all the life changes, I continued working on my memoir. I continued posting to my blog. Through some of the tough months I’ve had this year, battling sickness and discouragement, these entries have been my lifeline to sanity. They have been the only way I can process the enormity of the trail. Now, a year after we finished the trail, I think I can say that, through the writing of my journal, I have. We thru-hiked the PCT. We started at Mexico and hiked to Canada, a feat that I had hardly dared to believe we could accomplish. We did it. We won. From the moment we left the Mexican border, I kept waiting for myself to realize, all of a sudden, that we were really doing it, that we were really hiking the PCT. I kept waiting for it to hit me. Seventeen months, 2,600 miles, and 220,000 words later, it finally did. Love Zach's hair and hiking in Kentucky?!?!?! I would've loved to have met you all. I live near Bowling Green and near Mammoth Cave National Park. Where did you hike? Kentucky is a beautiful state with wonderful state parks and green ways and blue ways. 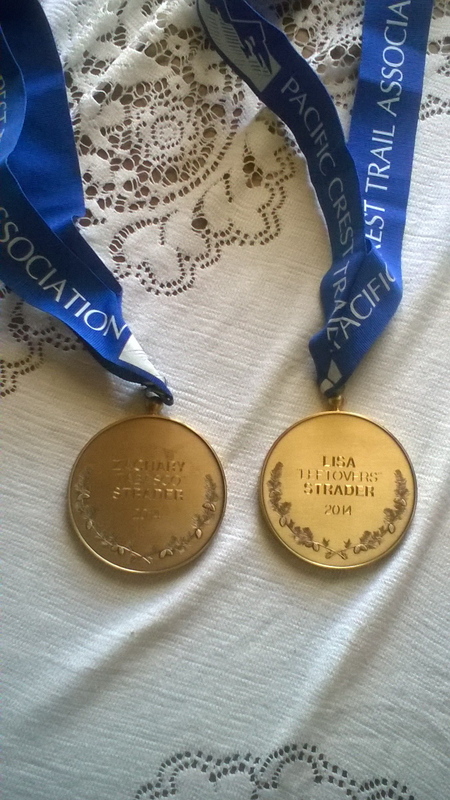 The medals are totally awesome btw and so well deserved! Yes, we spent a day or so in Kentucky back in March. I want to say it was the Jefferson Memorial Forest? Lovely scenery with all the bluffs and mountains. Then we spent the night at Louisville, which I thought was gorgeous! I had always just driven through KY on the way to other things, but didn't realize what a beautiful state it was. I definitely want to go back! Kentucky is an awesome state; home of Cumberland Falls (little Niagra of the south and moonbow), Kentucky Derby, Bourbon Trail, and so much more. I live near Mammoth Cave National Park, over 350 miles of discovered caves. every state has its own beauty, and we definitely have our share! Not too far from Missouri. Do you live close to Columbia or Cooper's Landing on the Missouri? P.S. I just remembered you live in St. Charles...tent camped there by the visitor center in the city park with the Great River Rumble in 2012; paddled 156 miles in 7 days. Loved your little town! Been following your blog the last couple months. Found it linked from the PCTA website. I met you two going up Muir Pass; chatted with you two again as you were leaving VVR and saw you sporadically throughout Oregon. I was one of the people in the Crater Lake laundry room during the storm. It really was an incredible journey. I probably think about it everyday. It's always nice coming across the blogs of people I've met. It's great that you waited a year to publish. Seems like a lot more thought and reflection went into them than other blogs I've come across. Sorry, I totally lost this comment in my inbox! Great to hear from you— I definitely remember our group bonding experience in that steamy laundry room with the power out. :D Thanks for your kind words, and I hope that post-PCT life is treating you well. Cheers! Lisa, recently I saw a post on vimeo.com for the free movie "Do more with less" (http://domorewithlessfilm.com/). It's one of the PCT-things, mostly philosophy and motivation - but it's made in 2014 and some of the credits go to hikers mentioned in your (excellent!) blog. You might consider watching it for some familiar faces. Thanks so much for the link, Marc! I'll bookmark the link and watch it when I'm ready to handle the flood of nostalgia. ;) Happy Holidays to you, too!! Congrats on completing the PCT. 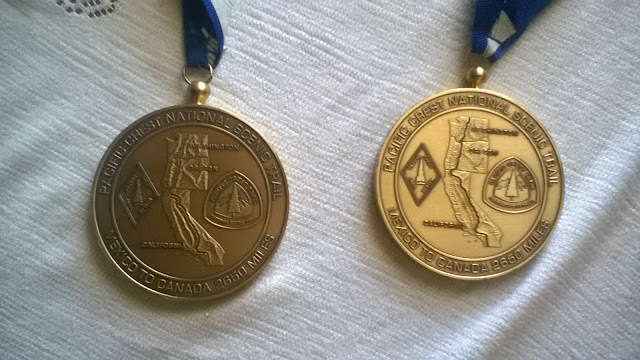 My girlfriend Amy and I are starting the trail this April and we LOVE both your nicknames as well as your medals. "Tobasco" and "Leftovers". Awesome!! We were wondering where you had the medals made and how you found/made them?? Could you email me some info? It would be much appreciated.